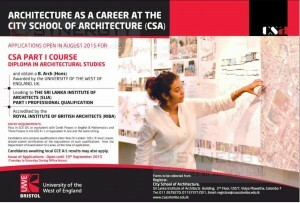 City School of Architecture (CSA) invites applications to be a Qualified Architect in Sri Lanka. City School of Architecture (CSA) offers qualifications to be architect in Sri Lanka with your basic education. B.Arch (Hons) by the University of The West Of England, UK. Pass in GCE O/L or equivalent with Credit Passes in English & Mathematics and Three Passes in the GCE A / L or equivalent in one and the same sitting. Candidates who possess qualifications other than Sri Lankan CCE (‘A’ level) exam, should submit certification of the equivalence of such qualifications from the Department of Examination Sri Lanka, at the time of application. Candidates awaiting local GCE A/L results may also apply.